Nearly all the pieces available for sale on our website are one of vintage and antique pieces and therefore each piece has a different cost to ship depending on the buyers location. If you wish to purchase an item please contact us via email at stonetribe@me.com with your post code and country and we will provide a quote for shipping within 24hrs. In that period the item will be reserved for you. If you are happy with the charge we will then send a invoice for the item and the shipping payable by PayPal or Bank Transfer. 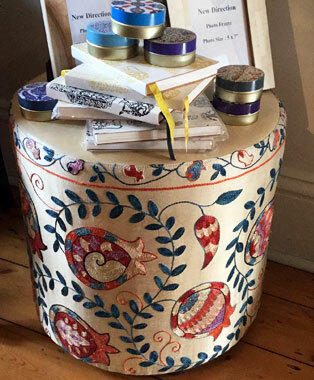 A runner made of a silk/cotton base cloth with silk embroidery made into an ottoman or side table with s leather top. 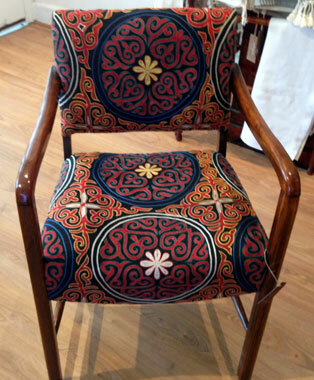 A vintage Australian Bridge chair restored and upholstered in an embroidered suzani. 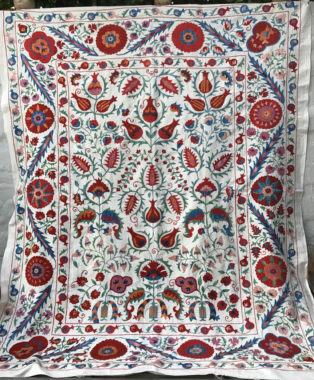 Absolutely stunning silk thread on a silk/cotton base cloth. 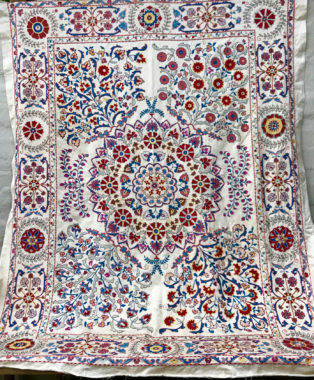 The embroidery on this suzani is predominately chain stitch. 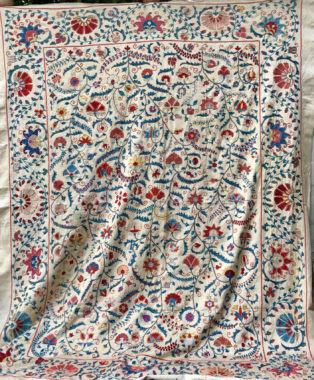 This is a stunning silk embroidered suzani with a silk/cotton base cloth. the intricate embroidery is of the finest quality. 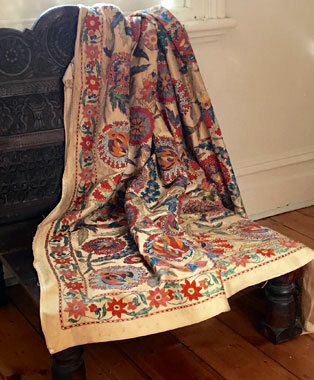 A smaller silk thread on silk/cotton base cloth featuring extremely fine couch stitching. 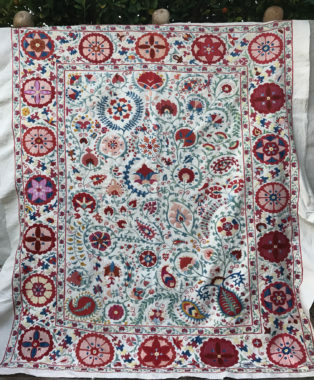 Silk thread on a cotton background this suzani has a very traditional floral pattern featuring stylised tulips and carnations. 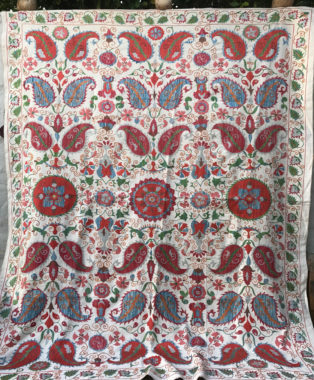 Silk thread on a cotton base cloth, this suzani features heavily a buta motif which inspired the paisley pattern. 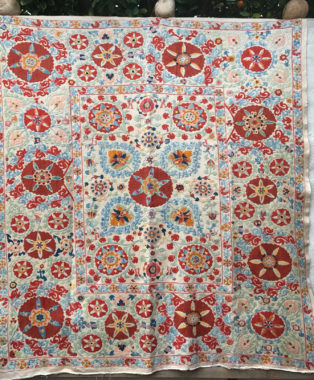 Silk/Cotton Thread on a cotton base, this suzani features large carnation inspired motifs with a heavy emphasis on “couching”. Silk thread on a silk/cotton base cloth. The embroidery is of the finest quality and the pattern very fine and intricate.